Today in America, 29 states and the District of Columbia have legalized the use of cannabis for medicinal purposes. A common talking point for those opposed to cannabis reform is that legalizing medical marijuana will make workplaces more dangerous due to alleged physical or mental impairment from use of the plant. Last week we reported on a weed breathalyzer device that is not just being marketed to law enforcement, but to private sector employers as well with claims that it will create a safer work environment by weeding out the riff raff. These scare tactics are the last ditch efforts by the losing side of prohibition, but until very recently there has not been any research to either confirm or properly dispute the claims. A report is due to be released this October in the peer-reviewed and highly esteemed International Journal of Drug Policy that could put this issue to rest once and for all. The research team included members from the Department of Agricultural Economics and Economics at Montana State University, the Department of Economics at the University of Colorado, and the School of Public Affairs at American University. With help from the Bureau of Labor and Statistics, they were able to gather and analyze a massive assortment of data regarding workplace fatalities from all 50 states and D.C. spanning the years 1992-2015. 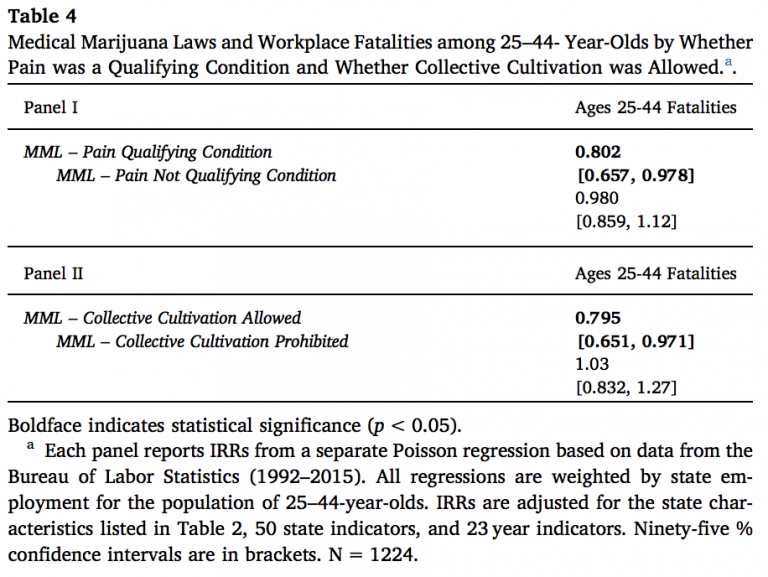 The immediate impact of legalizing medical marijuana was associated with a 19.5% drop in the expected number of workplace fatalities among workers aged 25–44. Once a state was 5+ years into their medical marijuana program, that number fell even more to 33.7% fewer work-related fatalities. Further, when a state allows MMJ patients to grow their own cannabis or join a cultivation collective, workplaces get even safer proving that convenient access to actual weed is a key part of any true cannabis reform or legalization. Though researchers refused to speculate too deeply, common sense and the prevailing theory is that if people are smoking cannabis on their own time, the chances that they are abusing alcohol or opiate-based painkillers as well is incredibly low. Whatever effects cannabis has on your motor skills or ability to perform a task is typically very short lived with the easiest of recoveries or “come downs”. If you like to spark up before heading to your boring job, we don’t blame you. Even if you arrive still baked, the buzzkill of the 9to5 grind awaits and you’ll be miserably sober again in no time. Pop a few painkillers or knock back a 5th of Jack, however, and you’re a legit risk to workplace safety. Unfortunately, most states do not offer any employment rights or protection for registered medical marijuana patients. If you take a toke on a Sunday, and your boss wants to test your piss on the following Friday, it can still cost you your career across most of America. With armor-clad evidence like this study, the hope is that those lawmakers will follow the lead of Democratic Congressman Charlie Crist, of Florida, who recently introduced legislation that would protect federal workers from losing their jobs and benefits based on cannabis use so long as they are following their own state’s laws. Furthermore, the results of this in-depth study shine a new light on the tiresome “stoned driving” debate. Nobody can honestly argue that smoking weed while driving is the safest option, but that is way different than driving with cannabis in your system. If the debate is about how to make our roads safer, the answer is simple. Legalize weed. For the exact same reasons that it makes the workplace safer, cannabis will do the same for our streets and for our society as a whole.